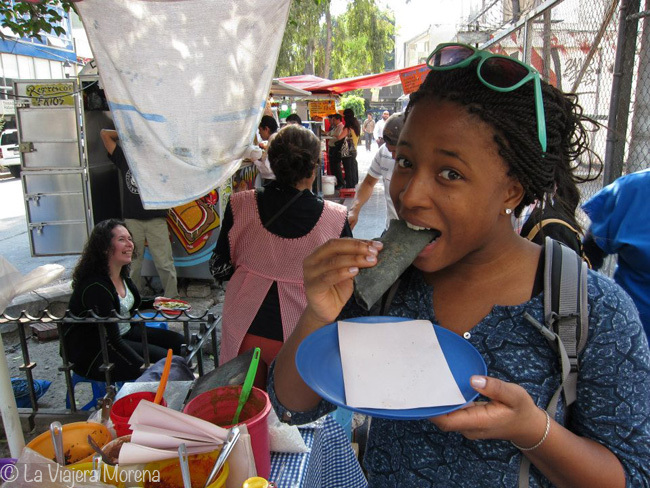 Mexico has a ton of great food to try and during my trip I enjoyed so many different kinds of foods. Here are five foods that you should DEFINITELY not pass up on while traveling to Mexico. A quesadilla in Mexico is not the same thing as what people who live outside of Mexico think of as a quesadilla. A quesadilla is more similarly compared to as what we Americans call a taco. Quesadillas can be made out of either flour or corn. I am pictured above eating a blue corn quesadilla . You can put in any toppings that you would like, and generally at a quesadilla stand there are a number of things for you to put in, such as chicken, cactus, lettuce, salsa, and beef. Sopes are small but thick round tortillas with toppings on them such as cheese, salsa, meat, and veggies. They are amazingly delicious and more filling than a quesadilla. An enchilada is a tortilla wrapped around filling and covered in sour cream and salsa. It can be filled with various different types of things depending on your diet. My personal favorite is chicken enchiladas with green salsa. A torta is a round Mexican flatbread sandwich. It is made out of crusty bread (called bollilos) instead of tortillas. The toppings that generally go inside of a torta are those you would put into a quesadilla or taco. Pozole is a soup made out of corn, meat, chili peppers, and other seasonings. Below, Charly Cheer is teaching me how to eat a pozole in Mexico. Stop it, you’re making me hungry! I love quesadillas but I have to admit I wasn’t overly keen on the green salsa when I visited Mexico. They are really easy to eat all of the time because they are so delicious! I like the look of the sopes… actually they all look good! Reading this article was the WORST THING I could do to myself right now!!! YUMMY!!!!!! We have been traveling through Asia for a couple months now and are literally dieing for some good Mexican food! Can’t wait till I can get my hands on some tacos and enchiladas again. The best tortas we ever had was at a place called Salon Corona on Avienda 5 in Mexico City, not far from the Zocalo. This post made me hungry! And I found it really helpful, as I have never been to Mexico, you did a great job of highlighting the differences between various dishes. I never knew the difference between enchilada and quesadilla! Everything looks sooo good and tasty in your photos! Haha yeah I had no idea that is what a real quesadilla looked like either!